The left background photo that focuses on the pier is split in two at the horizon - better to have been framed in thirds instead of halves. So, I planned on adding the kite photos at the top and bottom, ending up with the “Rule of Thirds” for the final layout. 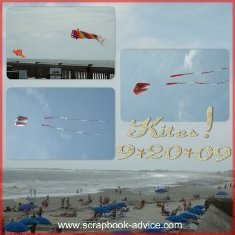 The right background photo is much better at representing the Rule of Thirds, with the Beach-goers at the bottom third leaving room again for me to add additional photos of the Kites on the top portion. No pretty clouds to cover up in that shot. Since these were digital layouts done using the Heritage Makers System, the font for the Title and Date came from the Premier Art available. The Sand Font was used for the Title Journaling. Since there was no punctuation, I used tiny Star Fish for the periods after the “S” and “C” and again for the dashes in the date. Click here to Check my Heritage Makers Consultant Page to try their System. You can get very creative with your Beach Photos if you focus on some of the larger and smaller items particular to the beach. Although a vast expanse is available, get there early or late in the day for the best photos. Beach Photography Tips: Direct overhead sun exposure tends to wash out photos and I feel like they lose depth. Another reason to try for early or late photos is there are fewer people on the beach at that time of day and it just makes framing your personal photos much easier. Here’s is a wonderful article by Darren Rowse on 10 Beach Photography Tips. Personally for Beach Photography Tips, I often like to focus on tiny aspects of the beach - the birds, the pattern the outgoing tide makes on the sand, the shells, the sunrise or sunset and the silhouettes at those times of day. These can make great additions and embellishments to your Beach Layouts and allow them to stand out. 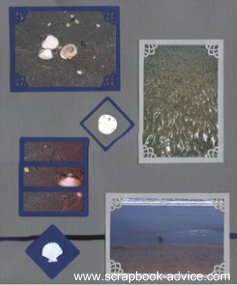 These layouts above have focused on Shells, the Birds and Sand Ripples left from the outgoing tide. They were captured very early in the morning as the tide was going out. I love to photograph flags, so if there is ever one close by, I manage to get a shot of it. Here I got three for one. Here is an article from Michael Carr, former About.com Guide called Beach Pictures - A Tutorial in Beach Photography and another article on taking Beach Macro Photography at Digital Camera Tips: Shooting Macro Pictures It's a Small World After All also from Michael Carr. Amateur Snapper Pete Williams has another great article on Beach Photography Tips with spectacular photo examples on the Amateur Snapper website. Here’s the critical one! That nasty sand and the moisture can certainly ruin your camera and damage your lens beyond repair. My suggestion is to be very careful and possibly enlist some help to guard your equipment if you are setting up a tripod and trying to stage a shot. Always keep your camera on the neck strap or wrist strap, never set it down and be aware that the wind can pick up very quickly around water and may blow sand. Or kids can kick sand or beach towels and blankets get moved and along with them - SAND! You might put a UV Filter over your lens to help protect it. And, take a small camera case to store your camera for that extra measure of protection when you have finished with your photography. Critical Read: Here is a very comprehensive article about Camera Care while at the beach that I have certainly used myself. This article from the New York Institute of Photography is invaluable and provides critical information to taking care of your camera for sand and moisture in summer and winter. What Camera Equipment to Bring? Don’t forget Extra Memory Cards and Batteries. What a shame to be at the beach and have to worry about your camera when you can’t even take pictures with it. A Polarizing Lens Filter which will help to bring out more vivid colors in your photos. Flash! Yep, take a careful look at your subject before you snap that photo. With all the bright sun be careful that your subject is not squinting and that the sun has not cast dark shadows on the face. You can use the flash to help avoid those dark areas. 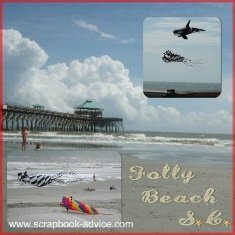 I hope you will find these Beach Photography Tips and Articles helpful and that you are on your way shortly to "some beach, some where" to practice your best Beach Photographs ever! Not able to get to the beach right now? Here's a little beach therapy to tide you over. Enjoy videos and pictures of amazing beaches with detailed reviews of popular beach destinations. 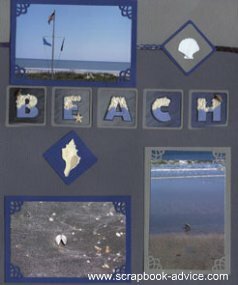 More ideas for Beach Scrapbook Layouts can be seen here.